Don't get stuck with shoes that don't fit! If you've ever been in a store that had shoes you love in an unfamiliar shoe size, a shoe size conversion breakdown is just what you need. 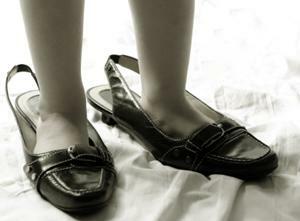 To find your shoe size, you can stand up and measure your foot in inches or centimeters. It's not exactly as simple as all that, though. From there, if you need to convert to a US size, or from men's to women's (or vice-versa), you can use a chart like the one found at Zappos.com. Here's an example: A US woman's size 5 is a men's size 3, 8 5/8 inches, and 22 centimeters. Another conversion chart you could use is at OnlineConversion.com. You can convert men's sizes or women's sizes from country to country. Here's a sample rundown: A men's size 10 in the United States and Canada is a 44 in Europe, 9 in Mexico, 28 in Japan, 9.5 in U.K. and Australia, and a 45 in France. While you're at it, you can convert clothing sizes, ring sizes, and more. If you're ordering online from a shoe store overseas or you're checking out the deals on eBay, you may not know what size to order. In another situation, you may wish to buy shoes sized for the other gender. Where do you start to look? A woman in the United States who is used to wearing a size six may fall in love with a pair of men's sneakers to wear for the workouts that are part of her New Year's resolution. She's online, shopping on eBay for a deal because she feels they're overpriced at the original overseas retailer's website. First, she'll need to convert her women's size six to a men's size (four), and then convert to the corresponding country's size. When her shoes arrive, they won't be horrifically large for her feet; checking a shoe size conversion chart would have saved her from disappointment. A shoe sizing chart can save you time, money, and eliminate one source of irritation when you're shoe shopping online or while vacationing in another country. You want the perfect fit-not a best guess. If you have an opportunity to try on a pair of shoes, do it regardless of how their size converts from men's, women's, or another country's sizing system. Trying them on is always better than a chart that tells you how a shoe should fit. When buying online, a chart is a great tool to have. However, if a pair of shoes is available at the mall or a freestanding store you can visit, your best bet for a good fit is to try it on there. There's a reason shoe size charts can't be used exclusively. As Heels for Less states on their website, the shoe industry can't be standardized. Two people can have the exact same foot length, but wear different sizes. Size depends upon the width and shape of the foot, too. You also have to take into account the type of shoe you're looking to buy. If your favorite pair of ballet flats are a size six and you're looking into some snakeskin stilettos with pointed toes, you shouldn't order the boots based on the fact that you wear a size six in the rounded toe flats. There's a good bit of variability from shoe to shoe and from person to person when it comes to shoe sizes. Use all the guidelines you can (looking for one size larger in pointed toe shoes, for example) and a shoe size chart to convert to the size you may need. That way, even if you're shopping based on another country's scale or the other gender's footwear, you should be able to get a good fit the majority of the time.